One of the Squad's early ambulances, c. 1960. 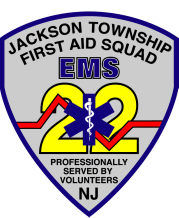 The Jackson Township First Aid Squad was formed in 1953. Over the years, much has changed, as the "Cadillac ambulances" of the early years, pictured right, have given way to modern box ambulances, and as Jackson Township has transformed from a rural community of a few thousand to a much larger suburban community of over 50,000, with many more visitors, especially during the summer months. In May, 1953, the First Aid Squad began with eight members, who ran a total of twelve emergency calls that year in a second-hand ambulance. Jackson had a population of approximately 3,500. Ten years later, by 1963, the Squad had run 438 calls in a community of about 6,000 - an increase of 112 calls over the previous year. In May 1966, the new Squad building, which had been built mostly by the members, was dedicated on what is now East Veteran's Highway (and what was then simply Route 528 in Van Hiesville, Jackson Township). The Squad still operates from this building, which has been expanded over the years. In 1969, development on the east side of Jackson lead to the construction of the Squad's first sub-station, Station 2, on the corner of Larsen Road and North New Prospect Road. Prior to Station 2's construction, an ambulance had to be stationed a member's home to be available for calls in that portion of the Town. By the Squad's 20th Anniversary, in 1973, calls totaled 1,084, with the Squad operating as Jackson's sole emergency ambulance service, 24 hours a day, every day. Squad Members outside the main station, c. 1976.